To bike along a river is sheer bliss. To actually be on the river is more! This bike and boat tour in Germany and France combines cycling perfection on riverside cycle paths and accommodations on a comfort plus boat. You unpack once and call the vessel your home! 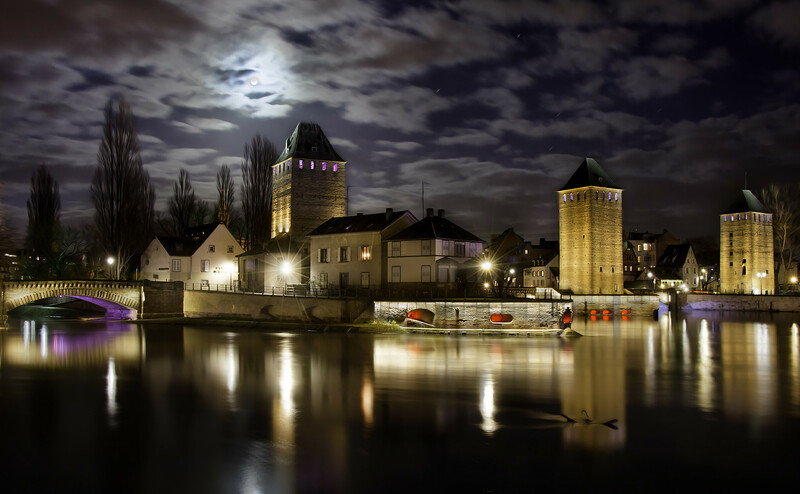 This tour begins in either Mainz, with its 1000 year old Romanesque cathedral, towering over the medieval and early modern quarters, or Strasbourg, the ultimate European city, with flavors of both France and Germany. In 2019, the boat will moor in Kehl, for the tour start or end. 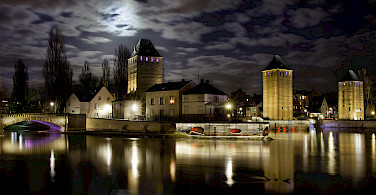 Kehl is 6 kilometers from Strasbourg and connected by a bridge. 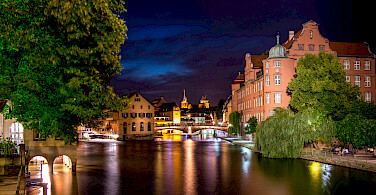 This is a tour that is more focused on urban Germany, interesting cities, architecture, and German industry. The bike and boat experience! The closest major international airport to Mainz and to Strasbourg is the Frankfurt International Airport (FRA). The Frankfurt Airport Regional Station is located below Terminal 1. If your tour begins in Mainz, you can access a direct train here with travel time of approximately 1/2 hour. 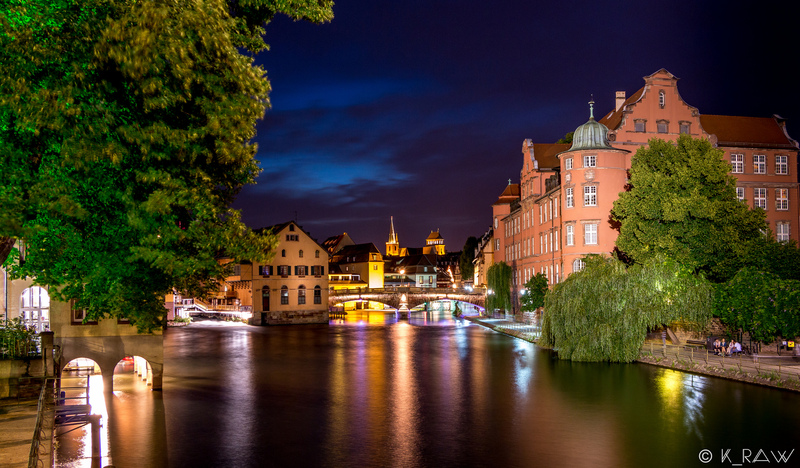 If your tour begins in Strasbourg, you will have approximately a 2 1/2 train ride with one or two transfers depending on departure time and type of train. Please check local conditions before your departure. 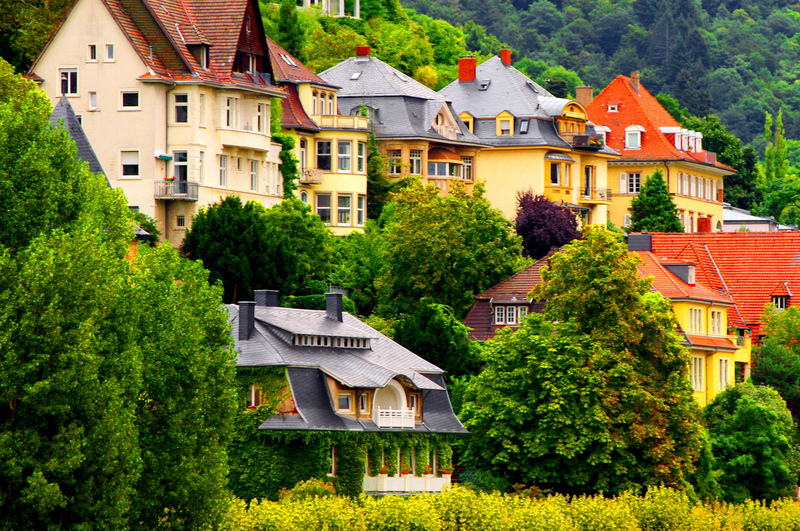 This region in Germany has a cool continental climate, moderated in places by the Rhine River and protected by a series of low mountain ranges. A good website to research average high/low temperatures, average rainfall, and more, is weatherbase.com. Average high/low temperatures in degrees F in the region during of time of travel are: June, 71/51 °, July, 75/57°, August, 73/55°, and September, 68/50°. Soft luggage recommended as storage space is limited. Optional excursions, tour lengths, and the ship‘s time in port permitting, an optional excursion program will be organized. 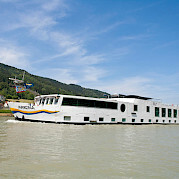 Excursions can only be booked and paid (in cash) aboard the ship. Special Dietary Needs: (e.g. 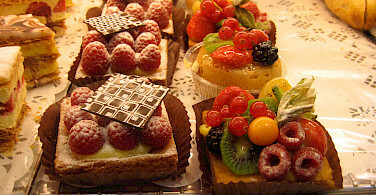 lactose- and gluten-free food) possible on demand and at extra charge, must be ordered at least two weeks prior to departure. 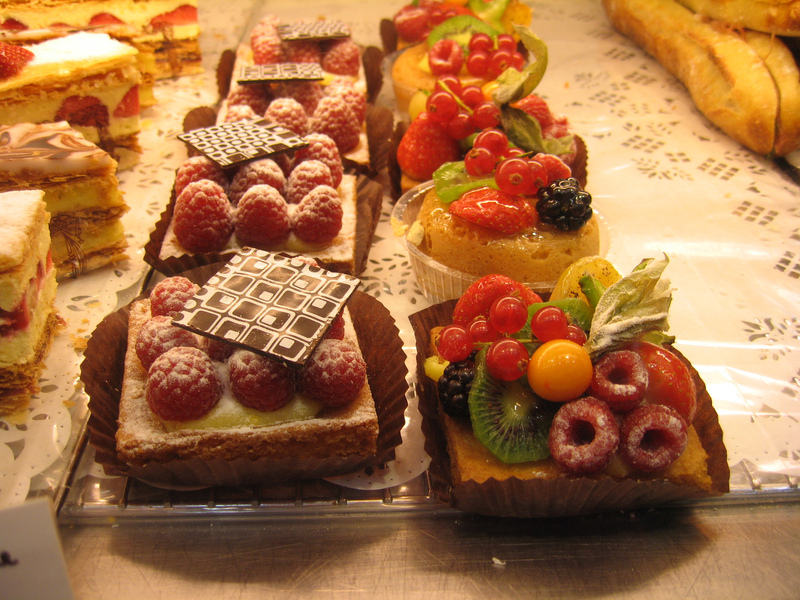 For certain special dietary products it may be necessary for you to bring your own! The quality of the cycle ways along the route is excellent. Most of the stretches are paved or asphalted, and lead along the Rhine dikes without any gradients to note. This makes the trip suitable even for beginners! All distances are approximate. Itinerary is subject to change. If a route cannot be shipped as a result of low or high water or bad weather, the captain reserves the right to change the route in view of your safety (this will not be accepted as a reason for free withdrawal). Individual arrival to Mainz. Embarkation will be from 3:00 – 5:00. There may be time to explore the capital of Rhineland-Palatinate with its lovingly restored half-timbered houses and the Romanesque Cathedral of Saint Martin. A short cycling itinerary is on the agenda today and thus plenty of time for one to indulge oneself! 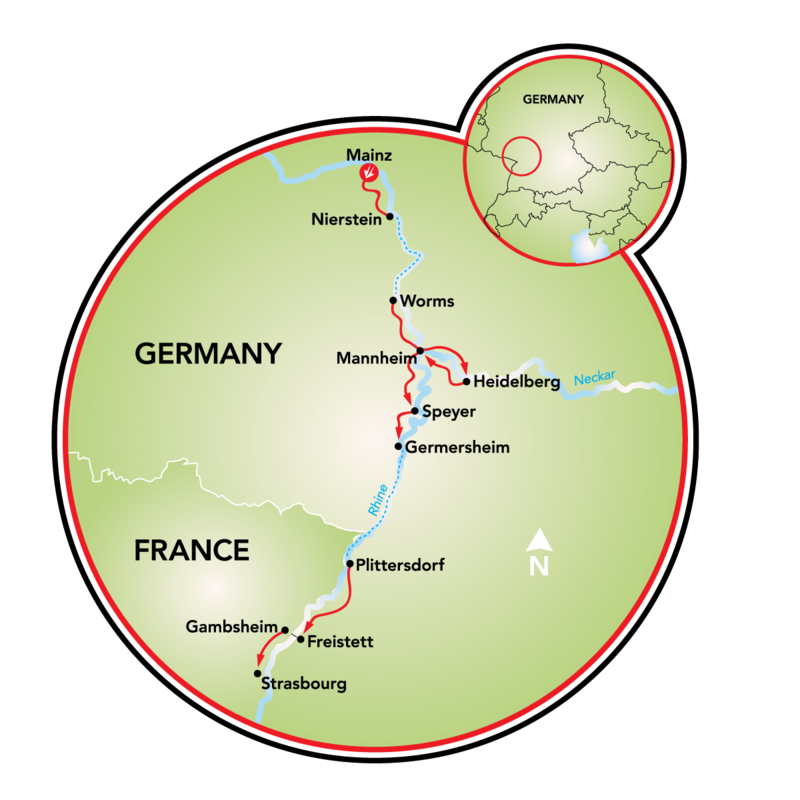 You will cycle on the Rhine Cycle Route with its well-paved cycle path directly alongside the Rhine to Nierstein. With almost 1,000 hectare of viticulture area, Nierstein is home to the largest wine-growing community on the Rhine. 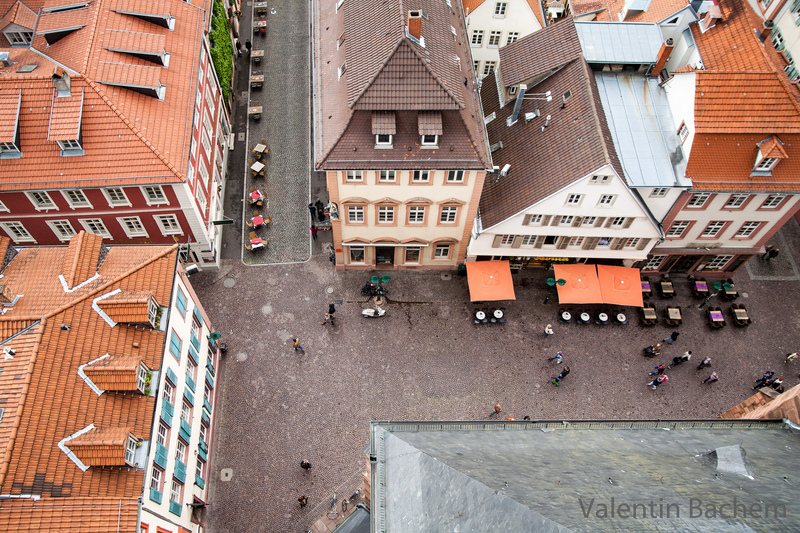 You will have opportunity to visit the historic Old Town with its medieval market square and the noble houses. In the afternoon, on board, you will navigate from Nierstein to Worms. If you would like to cycle a longer stretch, you can cycle the entire way from Mainz to Worms (cycle tour Mainz-Worms approx. 60 km). In the imperial city of Worms, you start your cycling journey. 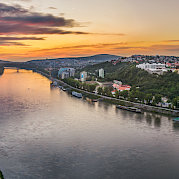 From Mannheim, you follow the course of the marvellous Neckar River up to Heidelberg. The Roman city of Ladenburg with its historic Old Town is well worth a visit. The ruin of Heidelberg Castle can be seen already from afar and towers over the city of Heidelberg, today’s destination. 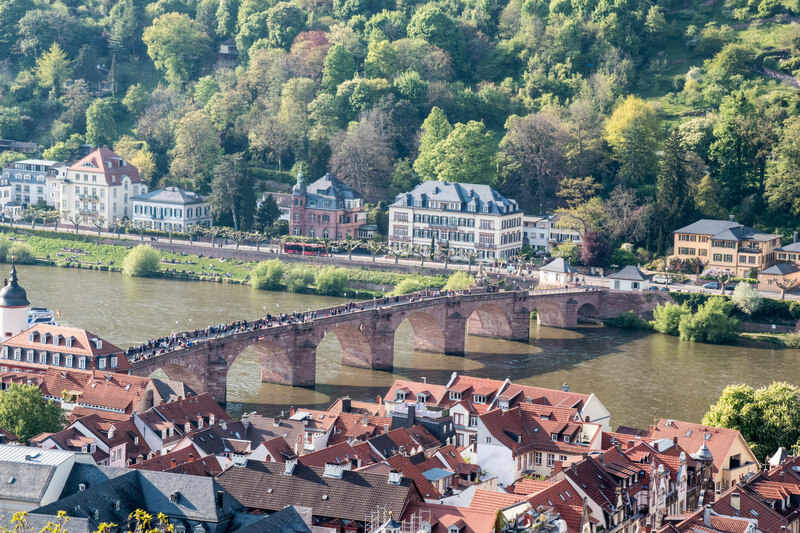 Admire the famous Heidelberg red sandstone bridge or take a stroll through the narrow lanes and see the picturesque square. Via Eppelheim and Plankstadt, you will cycle today through the core of the region of Electoral Palatinate, partly following the "Castle Road." Schwetzingen Castle and its gorgeous castle garden is just one reason to visit this charming town. From there the route leads you to today’s destination, Mannheim. Almost all sights of the city, like the water tower and Mannheim Baroque Palace, are only a few minutes walking distance away from the city center and are well worth visiting. Today’s destination is the cathedral city of Speyer. You cycle the numerous oxbow lakes of the Old Rhine. It is a short but very enjoyable bike ride past marvelous lakes, through unspoilt nature; areas that are designated Nature Reserves and natural flood plains. 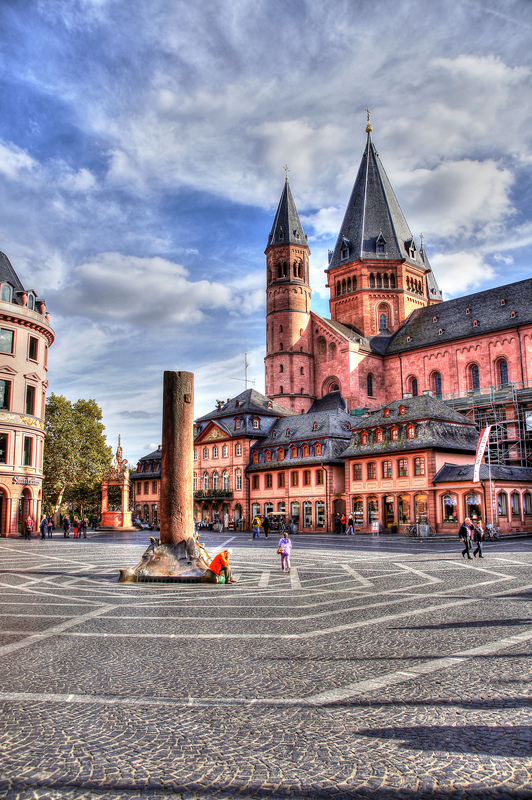 The Speyer Cathedral was added to the UNESCO World Heritage List in 1981. By bike, continue your tour through the Palatinate region past oxbow lakes and untouched nature. 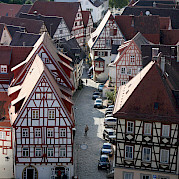 Look forward to visiting the old fortified town of Germersheim with its numerous picturesque lanes, corners and squares. During dinner your ship moves on to Plittersdorf where you stay for the night. On your last cycle stretch, cycle in an easy pace directly alongside the river through the gentle Rhine plain until you reach the lock station of Gambsheim/Freistett. 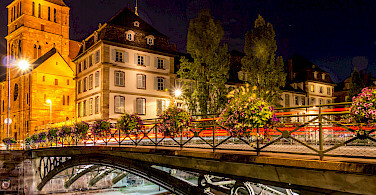 Your ship waits for you to bring you to Kehl connected by a bridge to the capital of the Alsace, the city of Strasbourg with its countless canals. 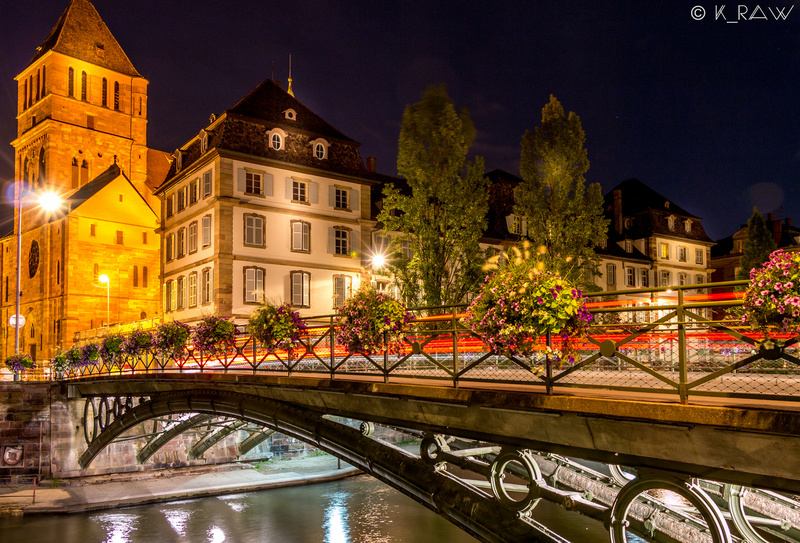 If you feel like it you have the possibility to stroll to the Strasbourg Minster, the landmark of the city, through the picturesque tanners’ quarter with its small historic half-timbered houses and enjoy a piece of French lust for life while the end of your journey approaches. 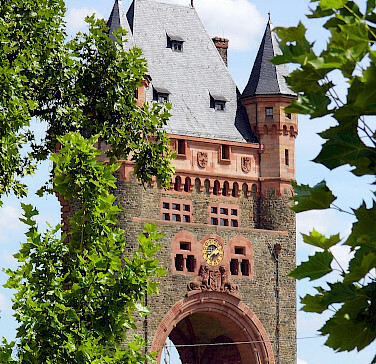 If you like you can cycle the whole tour to Kehl (cycle tour Plittersdorf – Kehl approx. 60 km). After breakfast, disembarkation by 9 am. 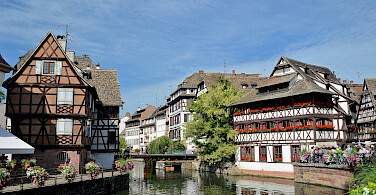 Embarkation in Strasbourg from 3:00 – 5:00 pm. 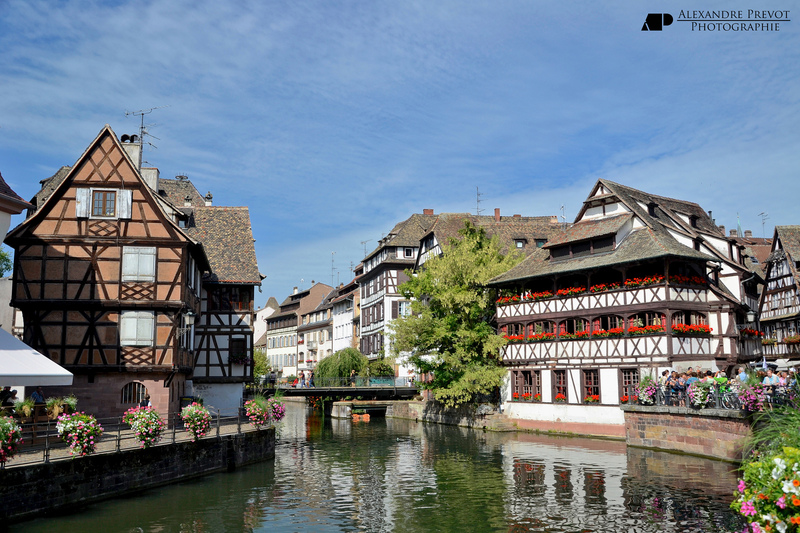 There may be time to explore the capital of the Alsace with its many canals! Early in the morning your ship starts its way to Germersheim. Here your today’s cycle tour begins: look forward to visiting the old fortified town of Germersheim with its many picturesque lanes, corners and squares. Continuing through the Palatinate land, you reach the cathedral city of Speyer. Speyer Cathedral was added to the UNESCO World Heritage List in 1981. 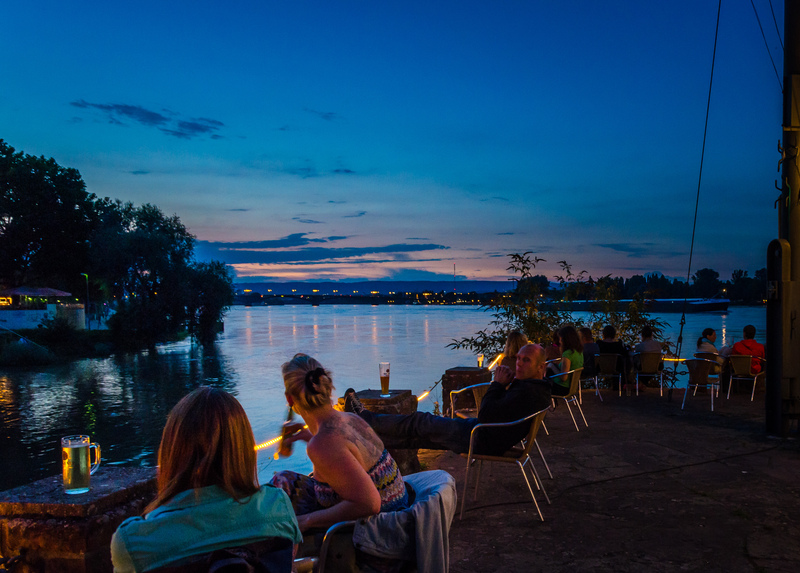 Enjoy a short cycle ride alongside the Old Rhine, past marvellous lakes, through untouched protected areas designated as National Nature Reserves and natural flood plains. 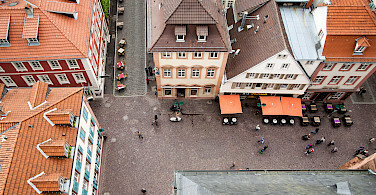 You reach Mannheim, also called the “City of Squares” due to its layout in a grid-pattern. 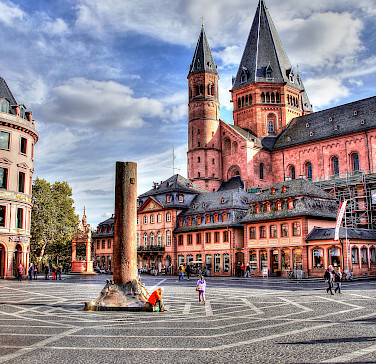 In these squares, countless places are well worth visiting as for example the famous Mannheim Baroque Palace, Germany's largest Baroque palace complex and the water tower, the city’s landmark. Today the tour leads through the core of the Electoral Palatinate and thus partly along the Castle Road. 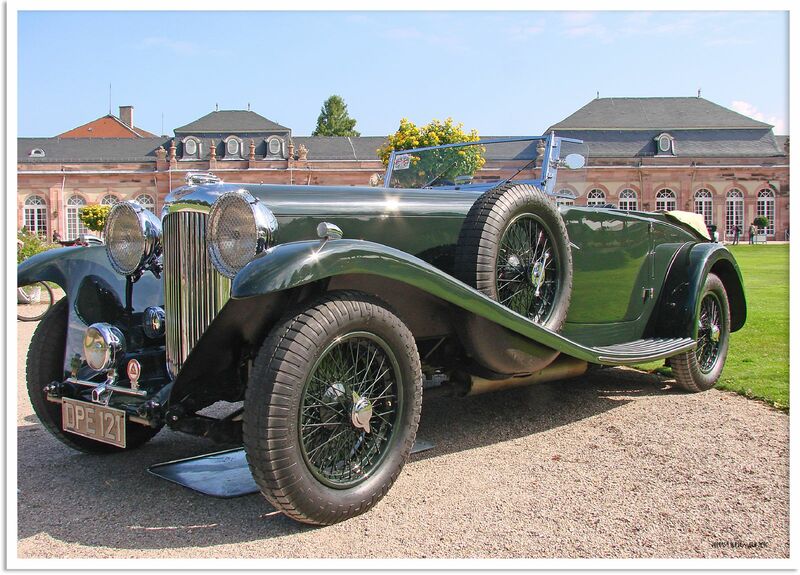 Schwetzingen Castle and its castle garden are only two reasons to visit the charming town of Schwetzingen. From here, the route continues via Plankstadt and Eppelheim to Heidelberg. Already visible from afar, the castle ruin of Heidelberg Castle towers over the Old Town. 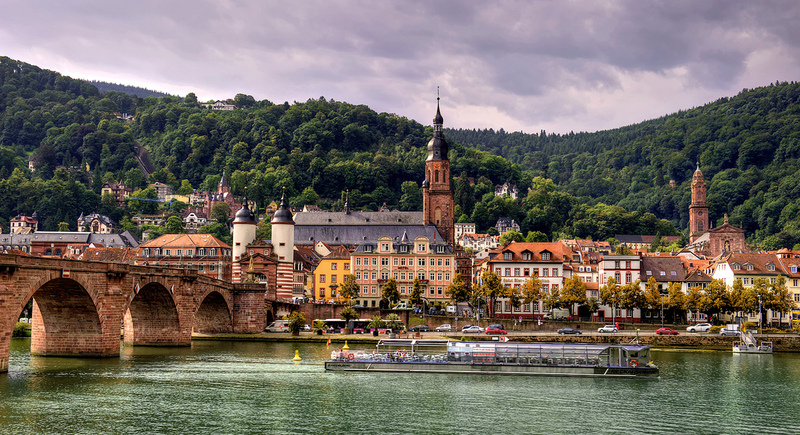 Admire the famous Heidelberg red sandstone bridge or stroll through meandering lanes and see the picturesque squares in the Old Town. 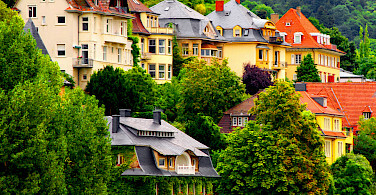 You leave the history-charged Heidelberg and follow the course of the Neckar River. The Roman city of Ladenburg with its historic Old Town is well worth a stop-off. 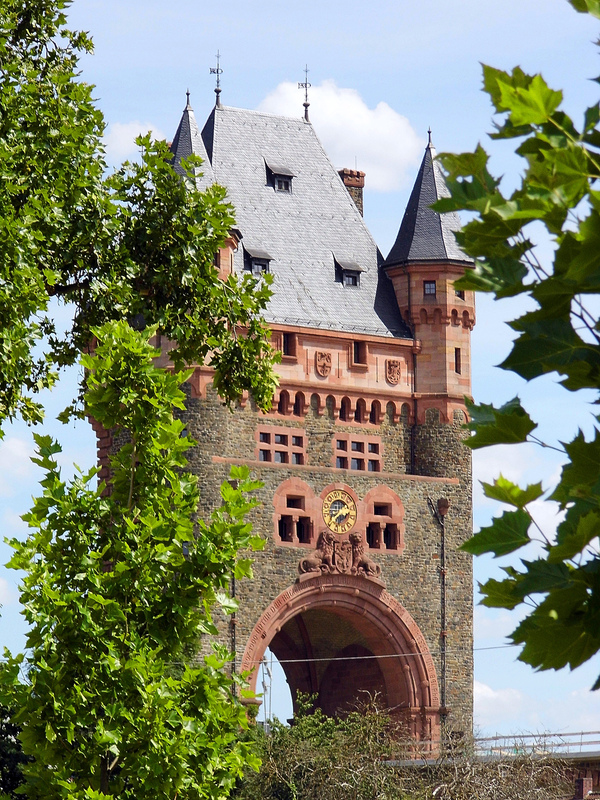 After Mannheim, you will be back on the Rhine and follow its course until you reach the imperial city of Worms. On your journey through two millenniums of the city’s history, learn about emperors and kings, myths and legends of the Nibelung, Judaism and Martin Luther. 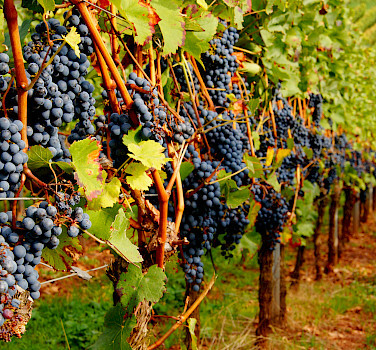 With almost 1,000 Hectare of viticultural area, Nierstein is home to the largest wine-growing community on the Rhine. 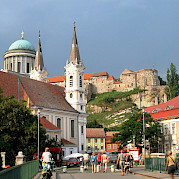 The historic Old Town with its medieval market square and noble houses is also well worth visiting. 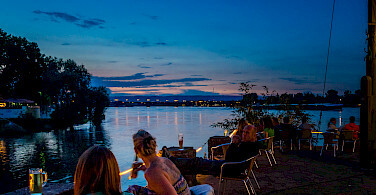 A short stretch that leaves plenty of time for one to indulge oneself, cycle on the Rhine Cycle Route, a well-paved cycle path directly alongside the Rhine from Nierstein to Mainz. 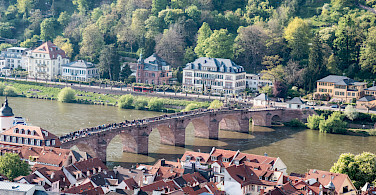 Guests, who would like to cycle a longer stretch, can also choose to start the cycle tour already in Worms. (cycle tour Worms-Mainz approx. 60 km). After breakfast disembarkation by 9:00 am. Individual journey home. 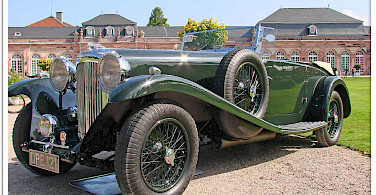 This tour is run by SE Tours. Much of the bike ride was difficult to navigate. Signs on the road are not always clear. Expected more country rides but much of the bike ride was through cities with many vehicles (somewhat dangerous). If we elect to travel with Tripsite again, we will do more research to determine ease of navigation along the bike route and how much of the route is through traffic. We were on this tour from June 16-23, 2018. First let me say that we had a fabulous time and I'll attempt to breakdown both the good and the challenging. 6. The rooms were tight, but manageable. two single beds, good storage for your clothes and a small but efficient washroom. 7. The bikes were well serviced and enjoyable to ride. If you're not a seasoned cyclist, don't worry, the gears were easy to change and many of the people opted for the ebike option which really helped. 8. Biking directions were a challenge. At first we thought it was a language issue, but many of the German people were getting lost as well. 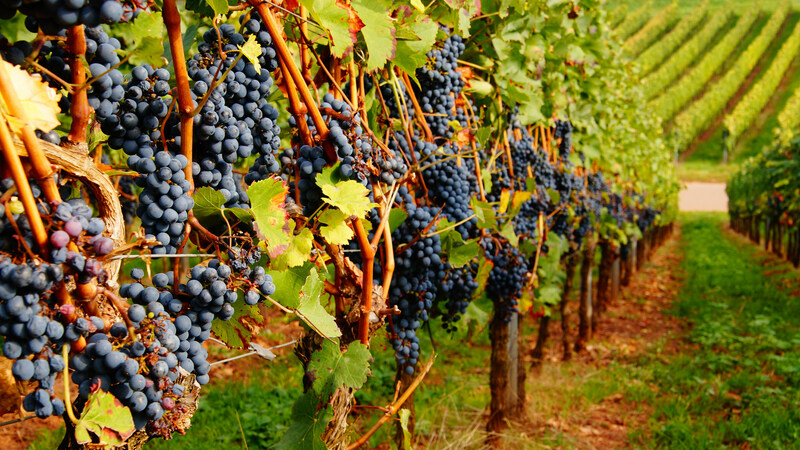 Read more… We saw no vineyards, one castle, and we traveled through many cities. We had three in our group take spills, mainly because of the city routes we had to take. The "Look for Signs" were often non-existant or hard to find and we found that our group of 10 cyclists were spending too much time conferencing, trying to find the correct route. Twice we encountered local people who actual lead us to get us back on track. This was definitely challenging, but boy did we bond!! We stopped in small towns having lunch in the town squares, trying local beers and cheeses. Restaurants willing to let us eat our bagged lunches in their restaurant when we bought some drinks. 1. Arrive a couple of days early to explore Mainz, it's a beatiful city. 2. We flew in and out of Paris and the train system is amazing, but I would suggest closer Airports (Frankfurt to get to Mainz and Paris for Strasbourg). 3. Get comfortable being lost and embrace the journey. We always found our way and have some incredible stories about our rides. 4. Talk to the locals they are magnificent and were always willing to help. The bottom line is that we are already planning our next bike and barge adventure, there are lots to choose. MS Arkona Austria, Germany, Hungary, Slovakia Deluxe Class Boat The MS Arkona is new to our program and was refurbished in the winter of 2017/2018. Both the upper and the main deck hold comfortable cabins of 11 m² which are modernly and tastefully furnished. All cabins feature hotel-style beds, en-suite facilities with shower and hair dryer, TV, safe and individually controlled air conditioning.